White Fox was launched by Gajane 2019 and was their very first all-white tobacco free product. The nicotine pouches are very unique with no discolouration on the teeth and minimal drip, creating a long-lasting snus experience. Even if there is no tobacco there is still plenty of nicotine, which give you that nicotine kick! 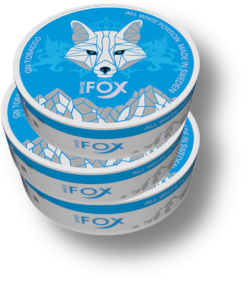 The flavour of the White Fox is reflected in the design of the can. A design you see in many other all white snus such as LYFT and Epok. The sides of the can are see-through so you can clearly see the pouches that are white as snow. The shiny blue background along with the silver fox and mountains reflects an icy cold day far up in the Alps. The pouches are super soft to the touch and leaves an icy sensation under your lip, they may be discreet, but you will definitely notice the tingle. Even if they are tobacco free, they still contain both nicotine and similar flavour to traditional snus. Gajane produces a wide range in flavours and formats. They are mostly known for their Siberia snus with the highest nicotine levels on the market. In other words, they sure know what the market wants and how to satisfy the needs. All white snus was a hit on the market 2018 and more innovations keep coming! There is not much more to do than look forward to the new era of snus and to the future ideas to prosper. Wir bieten eine breite Auswahl an portioniertem und losem Snus an für den online Handel. Alle Bestellungen werden mit dem schwedischen Postservice (Posten) und/oder UPS versandt. Kreditkartenzahlungen werden mit einer sicheren Verbindung mittels unserem Zahlungsanbieter Paynova durchgeführt. Unser Warenhaus befindet sich in Grebbestad an der schwedischen Westküste. Da wir täglich Lieferungen entgegennehmen, können wir garantieren, dass wir stets frischen Snus versenden. Wie lese ich das Ablaufdatum?